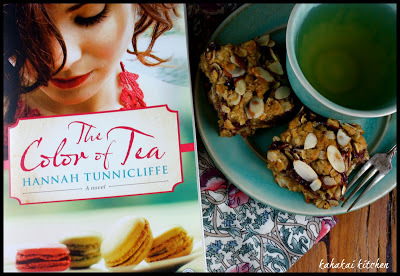 Plenty of delectable sweet and savory bakery and cafe treats are on the menu for the roundup of our April/May selection, "The Color of Tea" by Hannah Tunnicliffe. Cook the Books participants found inspiration in this novel, set in a macaron-filled cafe on the bustling island of Macau China. Get ready for your mouth to water! 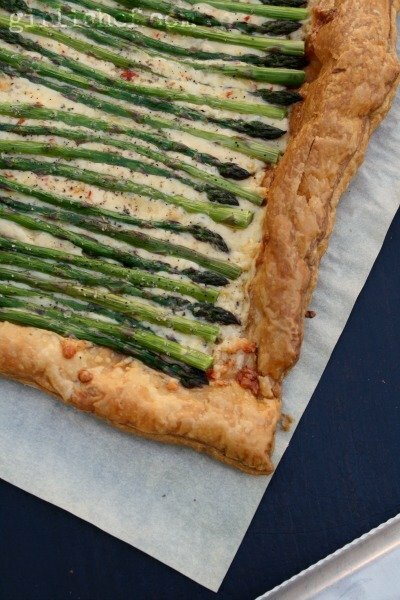 MY CTB co-host, Heather of girlichef, enjoyed her second reading of the book and made an elegant Asparagus Tart saying, "So, since it is full-on Spring, I turned to a veg that is in season right now to make my tart, Asparagus. Half of the slender spears standing at attention, the other half slightly bent to one side, as if swaying to the music...green and dusky purple. I also found a block of Monterey Jack cheese with brilliant red flecks of roasted red peppers inside that I knew needed a place in the tart. Add a little garlic oil...a smattering of black pepper and the smoked sea salt I'm so obsessed with, and it makes Spring seem almost as sensual as Summer." Although she didn't connect with the book, CTB co-host Simona of briciole found the inspiration to make some savory Roasted Carrot Scones, saying "The scones were inspired by the novel in the sense that they were a reaction to it. They are unadorned, crisp outside and tender inside, a bit rustic, a bit surprising with their nuanced flavor of carrot punctuated by the small pieces of candied ginger, simply irresistible. 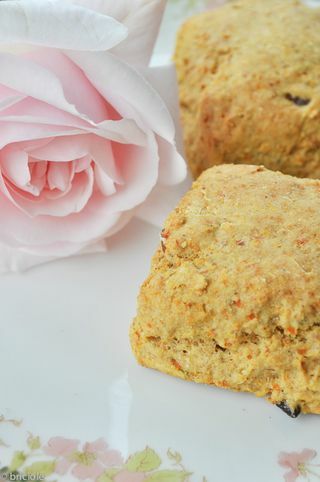 Scones are traditionally served with tea and without roses, but I was too excited about cutting the first pink rose of the season from my bush not to share it here." Camilla of Culinary Adventures with Camila found she couldn't put down the book. She got some help from her youngest "kitchen elf" to make these pretty Vanilla-Chamomile Cremeux saying. "This is one of his favorite desserts and one he's made more than once. I almost don't have to help him anymore. But we added some chamomile to the mix, this time around, to fit the 'tea' theme of this post. 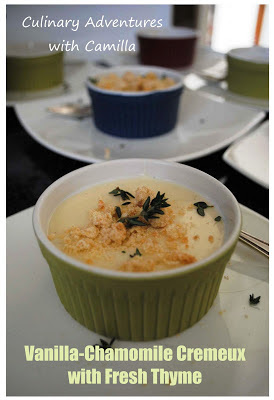 ... To serve, we topped the cremeux with cookie crumbles and fresh thyme." Claudia of Honey From Rock enjoyed the book (although she wanted to yell at Grace throughout! ), and was the one brave soul willing to take on the much-feared macaron, making these wonderful Pomegranate-Vanilla Macarons with Chocolate Ganache. She says, "I found something new (to me anyway) at the Natural Foods store, Pomegranate powder, and thought that would tint the cookies and help offset that sweetness. ... They were absolutely perfect for my women's OCC Prayer meeting Saturday morning, served with a pot of Thé au Chocolat, a lovely black tea flavored with dark chocolate." Debra of Eliot's Eats finds macaroons much more baker-friendly than macaroons and made some Lillan's-worthy Coconut Macaroon Tartlets with Peach-Honey Filling Chocolate Drizzle. She says, "What a lovely book—truly lovely. ... Macarons scare me but not macaroons. I used to think coconut macaroons were the fanciest cookies we ever made growing up. And, I still needed to use up some more of that stored away jam. 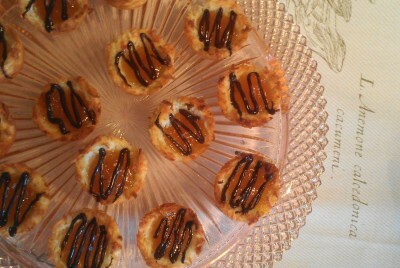 I would make macaroon tartlets, fill them with jam and drizzle them with chocolate. ... Not macarons, but maybe Grace would have allowed them in the shop." 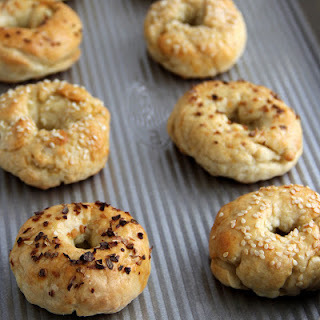 Danielle of The Growing Foodie plans to make her first macaroons at a cooking class on an upcoming Paris trip so she took on another bakery staple, Mini Homemade Bagels. She says, "I began to think of something comforting I could make with tea that draws on my own life. That's when I got to bagels. You see, bagels were great breakfast treats when we were growing up. And we were SPOILED with the best bagels in the world living in New York. When I moved to Boston, I was shocked at what passed for bagels. Okay, sure, I ate them but I craved a good New York bagel. Now that we're in New York, it's about time to make this tasty treat for myself. Pull up a chair next to your best friends, gab and gossip, and have a bagel. It's good for your soul." Marla of Sightsbitsandbites joined in for her second CTB round and says, "i found myself very easily pulled into this story. i’ve imagined myself relocating to a faraway land and starting anew. this is exactly what the main character (grace) does." 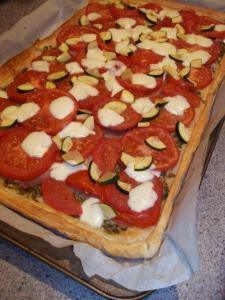 After conferring with her cooking partner Louise, a pretty Tomato Tart in a Parmesan Crust was on the menu. 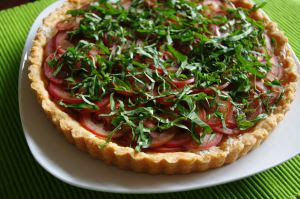 Marla says, "the main character and her future husband shared a homemade tomato tart the day they met, and the hopeless romantic in me knew that’s what i wanted to make too." 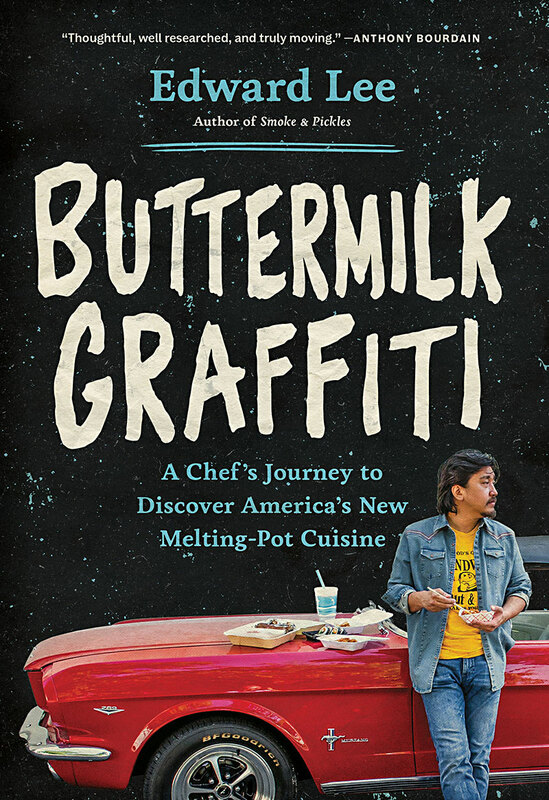 The other half of the dynamic cooking duo, Louise of Books, Cooks N Clubs, identified with the author--finding many things in common and enjoyed the book saying, "Along this journey, I enjoyed myself thoroughly. The sometimes frustration I felt with Grace …. yelling (with my inside voice) … “oh come on Grace”! Other times I was jumping for joy celebrating her successes right along with her and her friends." About her (first ever!) Roasted Tomato Tart she says, "I’m pleased to announce it was a successful baking adventure, (my husband took a 2nd helping and asked to take leftovers for lunch – he never does leftovers!)" Ana of Sweet Almond Tree liked the ability to journey to a place she had heard about in old movies saying, "“Macau… I may visit one day.” And just recently, I did. The trip cost something like 15 US dollars plus tax, and I took it sitting in the comfort of my reading chair." For her dish Ana picked a Pavlova saying, "What is a pavlova I thought, but a deconstructed macaron? Egg whites, sugar, creamy filling, almonds, fruit. Take the macaron ingredients apart, rearrange them (which is where the cooking term "deconstructing" comes in handy), and you have a whole new dessert, one in the shape of a pavlova!" Rachel, The Crispy Cook and fellow CTB co-host really got into the book once Grace opened her cafe, loving all of the descriptions of Grace's co-workers and customers and saying, "The reader finds out the intriguing back stories of these people and of Grace herself, which makes her a lot of more sympathetic than she was to me at the beginning of the tale." Rachel went the savory route with lovely marbled Tea Eggs, saying, "Reading this book provided the perfect opportunity to finally eggs-periment with making Tea Eggs, as I imagined that might be something found on the menu at Lillian's, Grace's Macau cafe." Finally, over at Kahakai KItchen, I lived out my fantasy of my own little cafe & shop vicariously through Grace. For my novel-inspired dish, macaron-making is WAY above my skill set and comfort level, so I opted for another of my favorite coffee shop treats, Raspberry-Almond Oat Bars. Buttery, soft and chewy, with a good combination of sweet cinnamon and tangy raspberry jam, they were just right with a cup of fruity berry-green tea. With all of these delightful dishes on the menu, I would love to come hang out at our virtual Cook the Books cafe with all of you! Thanks to everyone who joined in this round. 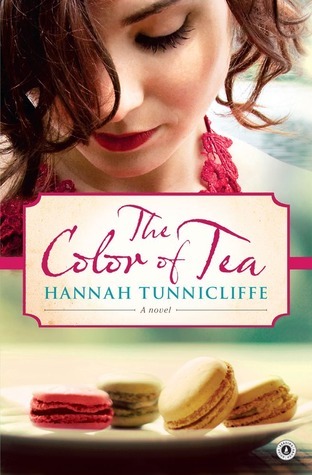 I do not envy Hannah Tunnicliffe, the author of "The Color of Tea" and our judge for this round, in having to pick her favorite! I'll be back soon with the post announcing our next four book choices (after our current selection of How to Cook a Wolf by M.F.K. Fisher and hosted by Simona). Following that will be be our judge's decision and then I'll turn things over to Simona for the next round.